I am on a holographic odyssey at the moment, and just can’t get enough of the twinkly twinkly stuff. 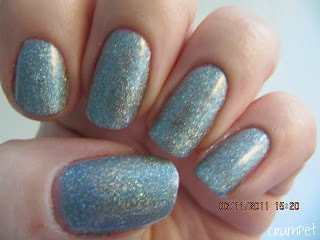 This is another Milani, relatively cheap, and relatively fabulous. 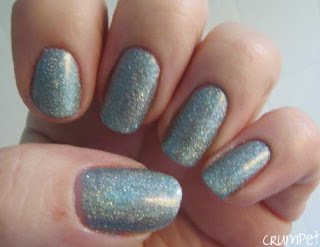 Cyberspace is a lovely delicate scattered holo, in tones of grey, silver and baby blue. The first coat goes on very sheer (might make a great top coat) and even after 3 coats here, I still had a couple of patches. The Milanis remind me most of coloured sugar or sherbert. There’s a coarseness or graininess to the holo that you don’t get with the more expensive brands, which makes this look like little tiny grains of sand. 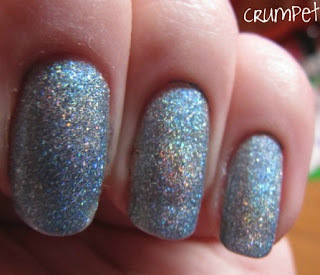 The holo in this is very subtle and was almost impossible to photograph. There is a smidge of golden twinkling, but it is very subtle, and it’s almost over-powered by the silvery tones of the polish. This is a nice subtle one for the collection, lovely and gentle, shy yet showy and a great change of pace, and maybe – just maybe – a great layering polish too.